Dr. Vasquez gives a presentation on the Mexican holiday of El Dia de Los Muertos as it is celebrated both in Mexico and north of the border. But this presentation can be only the first step in a more extensive process. The next step is for the students to get involved: to create their own presentation, using the background she has provided as a foundation. The event which they create can be a participatory one for all who attend, if they so choose. Dr. Vasquez will serve as a consultant, guide and directorial influence in the organization and presentation of this event, while all of the hands on decisions, groundwork and implementation will be handled by the students, so that the event is truly theirs. 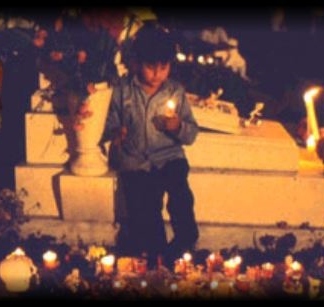 With the ancient tradition of El Dia de los Muertos, we truly honor one another in life as well as in death. When we speak out to our community the names and memories we have, we also make everyone realize how important we all are to each other. We often have no idea how much we are valued by others. As we hear the names, memories, stories we begin to understand that we all touch, move and strengthen one another individually and as a community without always being aware of it. Such celebrations of lives past also celebrate our own lives and the life of our communities.